More arrivals in the Foyer. Some of my friends in the shopping area. I had a painting selected for this prestigious Biennale which showcased artwork from 96 countries. 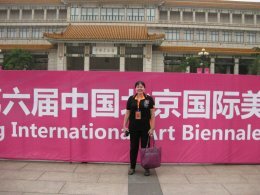 The exhibition was held at the National Art Museum of China from September 24th to October 15th and I was one of 5 artists representing the UK. I was also invited to Beijing so I could attend the Opening Ceremony and Symposium. Our accommodation and meals were provided at the Beijing International Hotel, and it was one of the most amazing experiences of my life! I had wanted to visit China since I was 11 years old, when I used to spend many hours copying animals and landscapes from books on Chinese painting. As I flew into Beijing airport it was like coming home! It was such an honour and we were wonderfully looked after. This album will be a work in progress and should eventually hold around 100 photos giving an idea of the Biennale, the National Art Museum of China (where the Beijing Biennale took place) the Opening ceremony, the luxurious Beijing International Hotel, our food, and the trips we were taken on to The Great Wall of China, and the Forbidden City. I also had several walks around Beijing and saw the important 798 art zone. I brought home so many exquisite memories and of course some Chinese brushes, ink, rice paper and watercolour! I am exploring my memories of China through a series of ink paintings; the album is on this website.